New news. Alarmingly funny and painfully true. Cost Guard: Listen, this is La Garde from IMF. Am I speaking with the captain? Captain: Good evening, Chief La Garde. Cost Guard: Tell me your name, please. 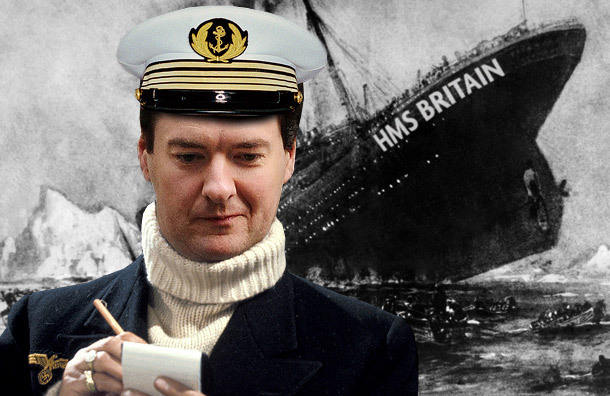 Captain: I am Captain Osborne, chief. Cost Guard: Listen, Osborne. There are people trapped on board. Now, you go with your lifeboat. Under the bow of the Economy, on the right side, there is a ladder. You climb on that ladder and go on board the Economy. Go on board the Economy and get back to me and tell me how many people are there. Is that clear. I am recording this conversation, Captain Osborne. Cost Guard: Speak up! (captain tries to speak) Captain, put your hand over the microphone and stop speaking in that ridiculously plummy, posh voice! Captain: At this moment the UK Economy is listing. Cost Guard: There are some bankers who are coming down the ladder on the bow. Go back in the opposite direction, get back on the Economy, and tell me how many people there are and what they have on board. Tell me if there are children, women, disabled, unemployed, NHS patients and what type of help they need. And you tell me the number of each of these categories. Is that clear? Listen Osborne, perhaps you have saved yourself from the crisis but I will make you look very bad. I will make you pay for this. Dammit, go back on board! Cost Guard: There is no ‘please’ about it. Get back on board. Assure me you are going back on board! Captain: I’m in a private hedgefund, I am under here. I am not going anywhere. I am here. Cost Guard: What are you doing, captain? Cost Guard (interrupting): What are you coordinating there! Get on board! Coordinate the rescue plan from on board! Are you refusing? Captain: No, I am not refusing. Cost Guard: Are you refusing to go aboard, captain? Tell me the reason why you are not going back on board. Cost Guard (interrupting, yelling): You get back on board! That is an order! There is nothing else for you to consider. You have sounded the “Quantitative Easing Alarm”. Now I am giving the orders. Get back on board. Is that clear? Don’t you hear me? Captain: I am going abroad. Cost Guard: Go! Call me immediately when you are on board. My rescue crew are in front of the bow. Wait, what? ABOARD not ABROAD. Captain: Where is your rescue crew? Cost Guard: My rescue crew is at the bow. Go! There are already bodies, Osborne. Go! Captain: How many bodies are there? Cost Guard: I don’t know! … Liam Fox, Andy Coulson… Christ, you should be the one telling me that! Captain: Do you realize that it is dark and we can’t see anything? Cost Guard: So, what do you want to do, to go home, Osborne?! It’s dark and you want to go home? Go to the bow of the Economy where the ladder is and tell me what needs to be done, how many people there are, and what they need! Now! Captain: My second in command is here with me. Cost Guard: Then both of you go! Both of you! What is the name of your second in command? Cost Guard: What is the rest of his name? Cost Guard: You and your second in command get on board now! Is that clear? Cost Guard (interrupting): You have been telling me this for an hour! Now, go aboard! Get on board, and tell me immediately how many people there are! A commentator (Stav) made this joke on http://uk.news.yahoo.com/clegg-disappointed-eu-veto-government-safe-101226334.html. True for all politicians. ” While walking down the street one day a ‘Member of Parliament’ is tragically hit by a truck and dies. The devil looks at him, smiles and says, ‘Yesterday we were campaigning.. ..